In 12-inch skillet, heat oil over medium-high heat. Stir in pasta; cook and stir 3 to 5 minutes or until golden brown. Stir in onion and garlic; cook 2 to 3 minutes, stirring constantly, until tender. 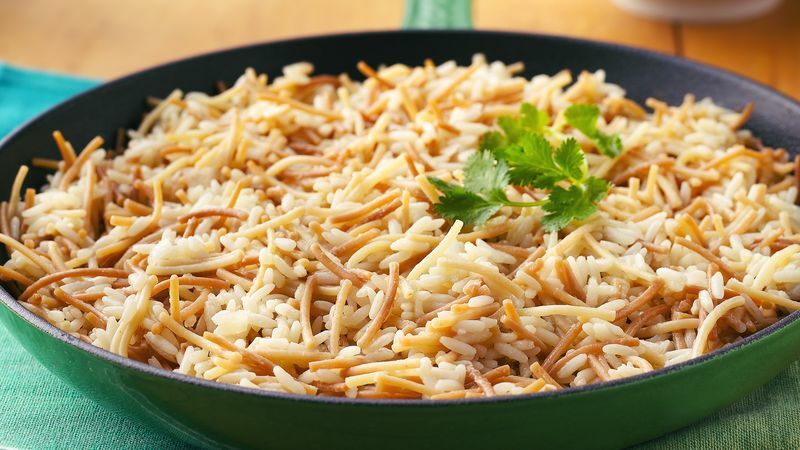 Stir in rice; cook 30 to 60 seconds or until light golden brown. Stir in chicken broth and salt. Reduce heat to low; cover and cook 20 to 25 minutes or until rice is tender and liquid is absorbed. Garnish with cilantro leaves. Why brown the pasta? It adds a nutty flavor and nice color to the dish. Fideo refers to thin strands of pasta, coiled in bunches.